We thought the simplest way to do a best of gear review was to ask each member of our staff what gear they appreciated the most over the past year. So here it is, nothing to please advertisers or make curmudgeons wince, just the best stuff we beat up out there. Coffee in bed. These three words are why I love this tiny stove that never fails me. On a winter climb of Rainier, I quickly figured out that I could literally roll over, reach out to the vestibule, crank the Jetboil on and have coffee in four minutes. Getting to stay toasty in my sleeping bag even when it was nuking out was huge. Bonus: brewing trailside coffee on an epic winter descent of Mt. Olympus got us through to the trailhead. 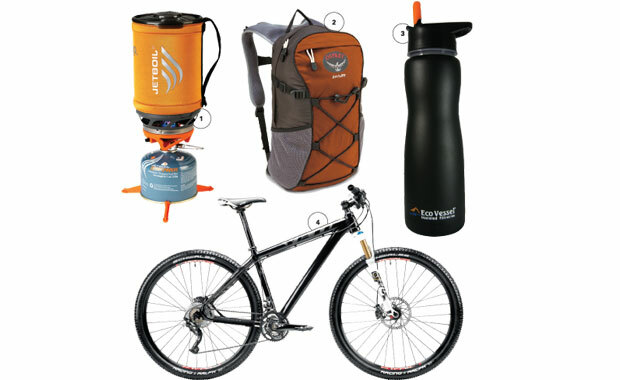 For day trips of any sort—peak bagging, cycling, touring, whatever—this pack fits me perfectly. It sits high enough to stay clear of my camera belt and easily carries water, a rain jacket, a warm layer, lunch and the other electronics and gizmos I need and use. During a recent trip to the Sierras, I brought only a single water bottle: the Aqua Vessel Insulated Filtration Bottle (25 ounce). We weren’t hiking or climbing, just catching up with the old crew around various water sources. When I got thirsty, I’d simply dip the bottle into a stream or lake, then instantly sip out of the straw. The insulated bottle kept the water cold, and the filter kept me from getting sick. This is one of my all-time favorite trail runners due to its light weight, lateral stability, stiff upper and sturdy traction. There are so many choices out there, but this shoe combines technical performance with the feel of a street runner, without a lot of bells and whistles. The geeky-tech-sounding stuff (Techlite fit, a bomber mesh upper, and Omni-Grip rubber, lugged sole and rock guard) all actually work for my short steep morning runs as well as all-day Summit-county hikes. I used to think all socks were created equal. I mean, they’re socks, how hard can it possibly be? But unfortunately, most socks, even merino wool ones, get dank and gummy after a full day on the trail. 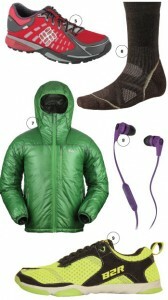 When I spent eight days on Kilimanjaro, I brought just two pairs of SmartWool’s PhDs. One would have sufficed, but I packed two just in case. What skinny guy (read: low enough body fat percentage that insulation is a must when temps drop below 50) named Adam wouldn’t love this Primaloft-insulated jacket available in the color “apple?” It comes with a hood and has thermal effectiveness even when wet, and it’s light enough (and packs into its own pocket) so that I you never have to leave home without it. I love music, especially a rocking bass line. Ergo, I love my Skull Candy Earbuds because they produce great sound quality and solid, pumping bass delivery. They get me up all the hills when I’m working hard on the bike, drown out noise on the plane and help me through the workday—without compromising music quality. Plus, they’re a great value. The first time I saw a presentation on barefoot/natural/minimal running I was skeptical—until I realized that this is exactly the way I learned to run as a sprinter in high school. As a flat devotee, I was excited to test the newest in the minimalist craze, the B2R, which features a separated big toe for better foot feel and was designed by Eric Orton, trainer to Born to Run author Chirs MacDougal. Beyond a flat shoe, Orton aims to strengthen the entire foot, which as yogis and martial artists know, strengthens the entire body. After runs on the Mesa Trail and working with Orton’s DVD and strengthening platform, I’m sold. To me, climbing is a chance to get out, away from crowds and experience the stillness and solitude of wild places. 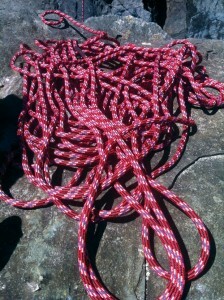 A slinky, supple rope—like a wet noodle—may be great for cragging, but when it comes to harsh, crumbling towers, I prefer a beefier rope that will stand up to heavy abuse day after day. That’s why I love the Beal Diablo 9.8mm Unicore. Designed for big wall, sport, trad and indoor, this line provides confidence in remote locales like Capitol Reef. Unicore means there is no sheath slippage, it’s hard to cut and it provides smooth handling. I don’t drink that often, but I always get a hankering for some moonshine when sitting around a backcountry campfire. I’ve hauled in cans of beer, wine in a pouch and even tried a powered beer product, but they weren’t extremely practical for the long haul and the powered beer was just….well, it was powered beer. 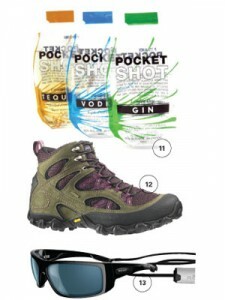 But, I recently found the perfect solution—the Pocket Shot, a recyclable pouch that holds just enough of my fave elixirs. I’m convinced the hot toddies made with whiskey and spiced rum are the only reason I made it through many long, freezing nights winter mountaineering. I knew I was going to love these boots forever when I took them on their first trek and realized they required no breaking in—seven hours up and down a Fourteener with no blisters, rubbing or even a hotspot, and I was the fastest one on the talus thanks to their sure-footed grippiness. From Colorado to Kilimanjaro, they’ve since proven themselves on nearly every type of terrain. I’ve got a wide nose and sensitive eyes, but the snug-fit Revo Headway makes wearing sunglasses so comfortable that I often forget I’ve got them on. The glass Crystal lens is super sharp and the word “glare” has suddenly been removed from my vocabulary. They go with me on every adventure. Got a favorite piece of gear that got you through the season? Add to this list!